For the people of the Northwest Coast the abundance of marine resources must have been one of the most important factors determining the availability of food. 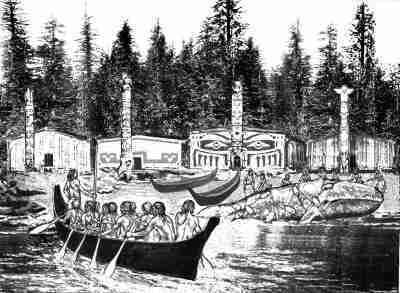 To exploit these resources effectively the people needed either canoes, or boats, which they made by hollowing out the trunks of cedar trees or of the giant redwood. Some boats were as much as sixty foot long, with a seven foot beam and could hold up to sixty people. To hunt larger marine mammals such as sea lion and whales, harpoons were used with floats attached to prevent them escaping. When whales were caught their mouths were sown up and additional floats were fastened to the animal to keep it afloat until it could be beached.